Classico is a fairly unknown song by Jack Black and Kyle Gass of Tenacious D, but I really like it since it incorporates classical music into modern day rock guitar. I like to refer to this piece as a classical medley, since it features their interpretation of 3 classical songs: Bach's Bourrée in E minor, Für Elise by Beethoven and Eine Kleine Nachtmusik by Mozart. This is a huge tutorial, with loads of technical elements that will surely develop your guitar skills. The lesson is divided into 3 parts, as per the 3 part classical medley. 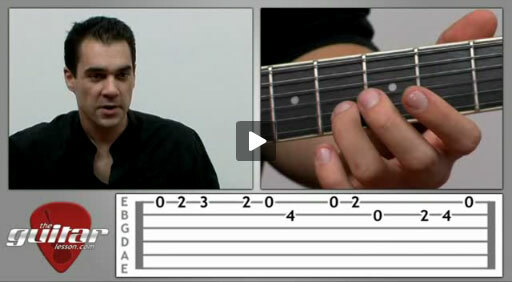 You will be playing Bach in the first part of the guitar lesson, and improve your single string alternate plucking and lead guitar technique. Afterwards, you’ll be playing Beethoven by learning several barre chords and arpeggios. In the final section, we’ll be learning how to play Mozart, and improve our lead guitar techniques once again, focusing mainly on alternate plucking, hammer-ons, pull-off, trills, and vibrato. So all-in-all, this is a beginner guitar song that will really improve basically every guitar skill imaginable. It’s not easy, and can get tiring due to its length, but just practice it a lot and you’ll be playing it soon. People love listening to classical music, and by learning Classico, you’ll already know 3 songs right off the bat. What a bargain :-)! Don’t be surprised, after this lesson you’ll probably want to go and learn how to play classical songs on the guitar some more. Classico is the second song in the 2006 movie Tenacious D in: The Pick of Destiny, performed by the band Tenacious D. In the movie, Kyle Gass play a medley of 3 classical guitar songs, to impress Jack Black, who sings along to the music, making up lyrics. Sorry, but you've reached a premium content area. The download of the Classico tablature file is only available to premium members. Sorry, the same goes for the backing track. To download the backing track to Classico, please log in and revisit this page.